If you want to buy a smartphone for personal use, there are tons of options to choose from. However, sometimes consumer phones don’t quite cut it for business use. Companies may want to have phones that are perhaps more powerful than the average handset or have some special security features. The good news is that there are plenty of smartphones that are well suited for business and enterprise use, and some of them come with features specifically made for those needs. Here’s a list of what we think are the current best phones for business use. Phones too small, tablets too big? Try phablets! The latest phone in the Galaxy Note series may be the best phone released for the business user by Samsung. It has some extremely high-end hardware inside. Even if you get the lowest priced model, you still get a phone with a 6.4-inch display, a Qualcomm Snapdragon 845 processor, 6GB of RAM, 128GB of onboard storage, a microSD slot for even more storage, and a big 4,000mAh battery that should last you at least a day, or perhaps more, on a full charge. You can even get a model with 8GB of RAM and a massive 512GB of storage, which is plenty of space to keep all of your important business files on the go. However, it’s not just the high-end specs that make the Galaxy Note 9 an excellent business handset. The S-Pen has been revamped, adding Bluetooth LE support. That allows you to use it as a remote controller to open apps, control the camera and more. This could be handy in business meetings if you mirror the Note 9’s screen on a big monitor; you can control the phone hands-free with the S-Pen. Speaking of mirroring the phone’s display, the Note 9 can also work in a PC desktop mode, thanks to Samsung’s newest version of its DeX technology. You only need to connect the phone to a monitor or TV with a USB-C to HDMI adapter and cable. 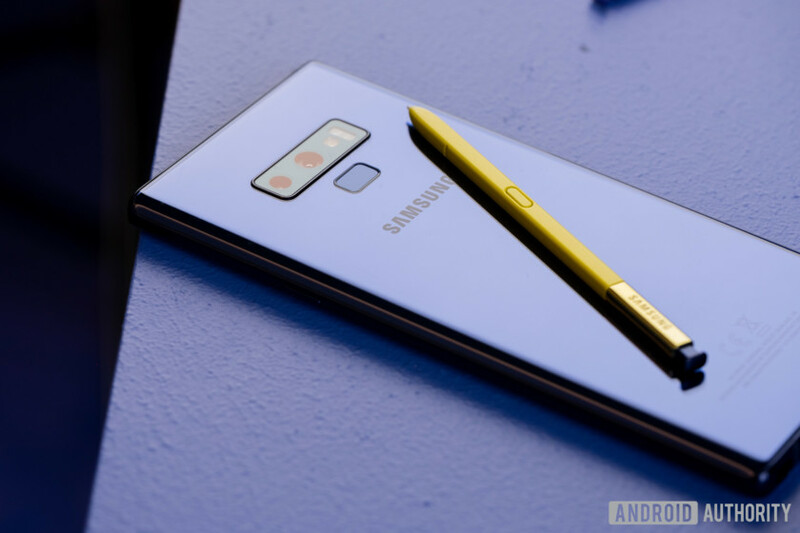 As we have stated, the S-Pen can be used to interact with the phone’s apps and features remotely, or you can use the Note 9’s display to mimic the use of a PC laptop touchpad or keyboard. This is perfect for the business worker who needs to get some assignments done on the road. As with all of the flagship Galaxy phones, the Note 9 also comes pre-installed with Samsung Knox. This is the company’s in-house hardware-based security technology that is supposed to be above and beyond what you might find on a standard Android phone. All of this comes at a cost; you will have to pay $999 to get the 6GB/128GB model and $1,249 for the 8GB/512GB model. The Google Pixel 3 XL is a great Android business phone. It’s one of the few phones out there with the pure version of Android 9 Pie, which means it can take advantage of the latest security updates, among other things. For one thing, any idle apps that might be running in the background can’t access the camera, sensors or microphone with a Pie update. Also, the OS supports randomized MAC addresses. If you are on the road on business and have to use a public Wi-Fi hotspot, this feature makes it much harder for anyone to track your phone. Google also confirmed the Pixel 3 XL will receive Android updates for the next three years, so you should be safe, or at least safer, from security bugs that might be discovered during that time. Aside from the Pie version of Android, the Google Pixel 3 XL has a superior single 12.2MP rear camera sensor, so you can take excellent photos for your boss if needed. It also has a big 6.3-inch display, a powerful Qualcomm Snapdragon 845, and much more. It’s certainly an excellent Android phone for business. The OnePlus 6T is an excellent smartphone and a great bargain. It has terrific hardware and software, and costs less than its competitors. It’s powered by a Snapdragon 845 SoC, 6 or 8GB of RAM (10GB if you get the McLaren Edition) and up to 256GB of storage. It has a large 6.41-inch Super AMOLED display with a small waterdrop notch. which always comes in handy for work purposes. The OnePlus 6T also comes with Dash Charge for its 3,700mAh battery, charges the phone fully in just over an hour — very helpful for the on-the-go business user. It should last for over a day on a full charge as well. The OnePlus 6T also has something no other phone sold in the U.S. currently has: an in-display fingerprint sensor. That alone should make it a good choice for the business or enterprise customer. You can get it for as low as $549. For the business phone user who want high-end hardware at a lower price point, the OnePlus 6T may be just for you. The recently launched Moto Z3 is one of the best phones for business for a couple of reasons. Like the other members of the Moto Z family, it supports Moto Mods, accessories that connect magnetically to the back of the device and add new features or improve existing ones. Two of the best for business users are the insta-share projector and the turbopower pack that adds an extra day of battery life to the handset. The other big reason is that, in early 2019, Motorola will sell a Moto Mod for the Z3 that will add 5G wireless connectivity to the phone, via its exclusive carrier Verizon. We don’t know how much this 5G Moto Mod will actually cost, but if you are a business owner or worker, and use Verizon, and are also in a city with the carrier’s 5G support, you might want to consider getting both the Moto Z3 and the 5G Moto Mod when they launch, as real 5G phones will be few and far between next year. You can get the phone from Verizon for $480 without a contract. Remember when using the term “CrackBerry” meant that you were addicted to using your BlackBerry phone? While those days have come and gone, the classic BlackBerry name and phone design recently came back in the form of the KEYone. The phone, made by TCL Communication, now has a successor in the BlackBerry Key2. The QWERTY physical keyboard that returned with the KEYone comes back with the Key2. TCL decided to increase the size of its keys by 20 percent compared to the ones on the KEYone, which should make it easier to use for business users. There’s also a new “speed key” feature which will let you launch your app shortcut no matter which screen or app you happen to be using. It should make using the Key2 much quicker. The Key2 has a large 3,500mAh battery, which TCL claims will last up to two days of normal use on a single charge. The phone also includes a new Power Center app. This will give business phone owners more control over which apps use up battery life on the phone. Speaking of software, the phone comes pre-loaded with BlackBerry’s own DTEK security app. It is supposed to help monitor any malware issues that might crop up in apps or even in the Android OS. This is, of course, highly important for business users. Also, the Key2 has a new private locker, which allows you to drop apps, pictures, or video inside it securely. You can only access that locker, and anything that’s inside it, with a password, PIN, or your fingerprint. If you place apps with shortcuts on your home screen in the Key2’s private locker, you will still have to go through the private locker’s security measures to open the app after tapping the shortcuts. All of these features, along with improvements like dual rear cameras, doubling the RAM to 6GB and doubling the storage to 64GB, makes the BlackBerry Key2 one of the best and most secure business phones ever made. As the name suggests, the BlackBerry Key2 LE is a smaller version of the Key2 phone design. The keys on this phone are 10 percent smaller than the Key2, and its body is shorter overall, despite still having the same 4.5-inch display. Inside, there’s the Qualcomm Snapdragon 636 chip, 4GB of RAM and 32GB of storage. You also get two cameras here, but they have been cut down to 13MP and 5MP sensors, along with an 8MP front-facing camera. Finally, there’s a 3,000mAh battery to keep things running. Of course, the Key2 LE has all of the software security features of its big brother too. Business users who think the Key2 is too big or expensive might like the Key2 LE. It’s available unlocked on Amazon for $449.99, or you can wait until Verizon Wireless sells this phone as part of its small business division. As usual, the smartphone ecosystem changes nearly every day, so if any new devices pop up that we think would be good for business customers, we will update this list with the latest and greatest. In the meantime, which phones for business do you think should be on this list? Let us know.